ACONCAGUA Argentina, the Stone Sentinel, the World's highest mountain outside the Himalayas, 6,962 m / 22,841 ft. Tow a hang glider over it? Well, of course every project involving very high mountains has its extreme challenges but this is a very experienced team who did the same thing Over Everest (8848m) on May 24 2004. This area has a reputation as one of the World's best locations for 'mountain wave', a meterological phenomenon where it is possible to reach great height in rising air currents generated by wind striking large mountain ranges and a secondary objective is to attempt to reach 10,000m or more in these winds, higher than we went on the Everest flight. British Microlight pilot Richard Meredith-Hardy and Italian hang-glider pilot Angelo D’Arrigo started preparing for the Everest project in 2002. It was a highly technical exercise requiring the development of a lot of specialist equipment to cope with the extreme conditions. Very high takeoffs, (12,200 ft), temperatures of minus 25° C at altitudes where without oxygen the normal ‘time of useful consciousness’ is less than one minute. 1 December 2005 All equipment despatched to Argentina. 10 December Complete team assembled in Buenos Aires. 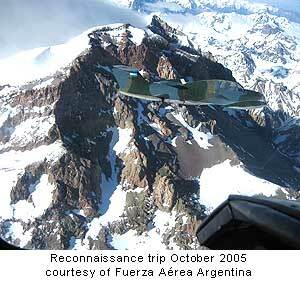 12-18 December Establish base camp at Mendoza and advanced base camp at Puente Del Inca. 19 December - 12 January 2006 Flight operations. 16 January Return to Europe. This time the expedition is expected to be logistically much less challenging. Takeoff will be at 2700m / 8900ft on a tar road, the main highway between Argentina and Chile. Much of the equipment will be the same as was proven in Nepal, but Angelo will be using the latest Stratos glider from Icaro 2000 with a Woody Valley harness incorporating a transparent nose cone. 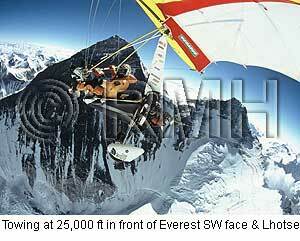 The same special Microlight tug prepared for the Everest expedition will be used. This consists of the renown UK built Pegasus Quantum trike equipped with a Turbo-intercooled Rotax 914 engine and a Pegasus XL wing. 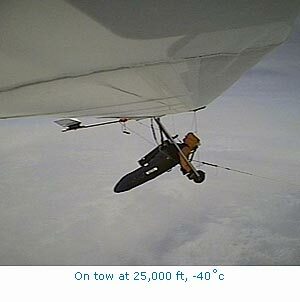 The hang glider is towed behind the microlight on a 65 metre rope fitted with various safety devices which allow it to be released in the case of emergency or malfunction. Both pilots will be wearing military style pure oxygen breathing systems and a 'get you down' backup system and very effective all-in-one down suits to protect against the extreme cold. The microlight pilot also has an electrically heated inner suit powered by the engine. Detailed meteorological research of the Aconcagua region indicated that it may well have been be possible to soar in Mountain Wave to 10,000 metres or more over Aconcagua in the summer season. Richard Meredith-Hardy was World Microlight Champion in 1990. He has also been World Cup, European and British champion. He flew a microlight from London to Cape-town in 1985/6 and has been involved in many other flights in strange places. He was awarded the Royal Aero Club’s Gold medal in 2002 and the prestigious Britannia Trophy in 2004. He lives in England 50 Km north of London. Angelo D’Arrigo has been flying hang-gliders for more than 20 years. Angelo flew the central Mediterranean migratory route from Tozeur, central Tunisia to Catania, Sicily in 2001. (Richard was tow pilot). In association with a Russian university Angelo accompanied a flock of endangered Siberian Cranes in a Hang glider equipped with a ‘Mosquito’ power unit 5,500 Km from the Arctic circle in Siberia, across Kazakhstan to the shores of the Caspian sea in Iran. He lives in Sicily near Catania.